First, add one more line to the help.html file: <p><a href="about:blank" onclick="app.exit()">Exit the Application</a></p>. 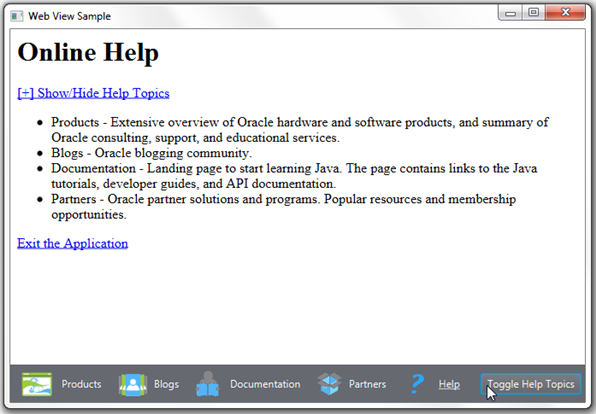 By clicking the Exit the Application link in the help.html file, the user exits the WebViewSample application. Modify the application, as shown in Example 6-1, to implement this functionality. Examine the bold lines in Example 6-1. The exit() method of the JavaApp interface is public; therefore, it can be accessed externally. When this method is called, it causes the JavaFX application to terminate. When you compile, run the WebViewSample application, and click the Help icon, the Exit Application link appears at the bottom of the page, as shown in Figure 6-1. Description of "Figure 6-1 Exit Application Link"
Examine the content of the file, then click the Exit the Application link, shown in Figure 6-1, to close the WebViewSample application.